A circlet inscribed ARGYLL AND SUTHERLAND. Within the circlet the cypher "L" of the late Princess Louise, interlaced and reversed. On the left of the cypher is a boar's head and on the right a cat-a-mountain (wild cat). Above the cypher and overlaying the top of the circlet is the Princess's coronet (a Royal Ducal coronet), all within a wreath of thistles. A pair of lugs to reverse. Badge of pattern worn 1882 to 1958 and 1967 to 2006. The predecessor Regiment was raised as the 98th (Argyllshire) Regiment of Foot (Highlanders) in 1794, by Colonel Duncan Campbell of Lochnell on behalf of the Duke of Argyll. . In 1798 the Regiment was re-numbered 91st. In 1809 the “Argyllshire” and the “Highland” subtitles were dropped but in 1820 the Regiment regained part of its heritage when re-designated 91st (Argyllshire) Regiment of Foot. 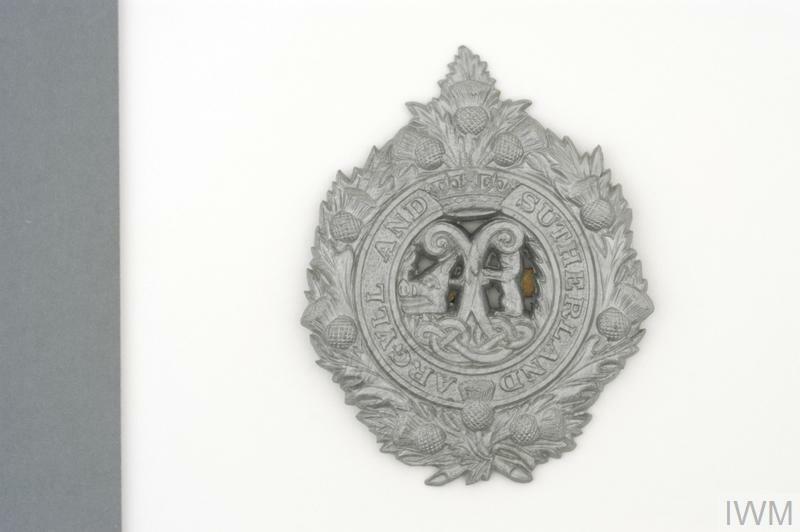 In 1864 the remaining heritage title was re-possessed when the Regiment was again re-designated, now as 91st (Argyllshire Highlanders) Regiment of Foot. In 1872 the Regiment gained a royal title in commemoration of the marriage of the Marquis of Lorne, heir to the Duke of Argyll, to Princess Louise, sixth child of Queen Victoria. The Regiment became the 91st Foot (Princess Louise’s Argyllshire Highlanders), the Princess becoming their Colonel in Chief. The junior predecessor Regiment was formed at the behest of the Earl of Sutherland’s family by General William Wemyss of Wemyss. It was embodied at Inverness in August 1800 as the 93rd (Highland) Regiment of Foot. The “Highland” sub-title was dropped in 1809 but regained in 1821. In 1861 it was re-designated 93rd Foot (Sutherland Highlanders). In the 1881 Cardwell/Childers reforms, the 91st and 93rd were amalgamated to form Princess Louise’s (Sutherland and Argyll Highlanders), amended the following year to reverse the order of the “Argyll” and “Sutherland” sub-titles. The badge adopted at this time was to remain unchanged until 2006. It incorporated an outer thistle wreath from the 93rd and a central interlaced cypher of Princess Louise, deriving from her association with the 91st, with a boar’s head and a cat-a-mountain (wild cat), respectively from the Argyll and the Sutherland family badges. A Royal Ducal coronet, deriving from the Princess, was set at the top centre of a circlet carrying the Regimental name. 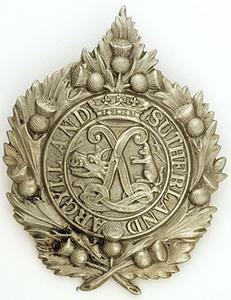 In 1920 the Regiment was re-designated Argyll and Sutherland Highlanders (Princess Louise’s). In 1958 the Regiment became part of the Highland Brigade, the Regiments expected to wear the Brigade badge. The Regiment left the Brigade in 1967 (the Brigade was broken up in 1969) and regained its independence and badge. In 2006 the Royal Regiment of Scotland was formed from the units previously forming the Lowland and Highland Brigades. 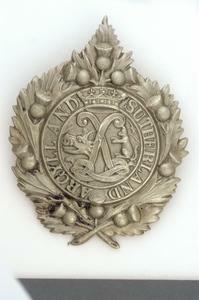 The Argylls became “The Argyll and Sutherland Highlanders, 5th Battalion the Royal Regiment of Scotland”. They wore the new Regiment’s badge, with a green hackle.